Dhaka, October 24, 2010: The Ambassador of the Republic of Korea in Dhaka Mr. Taiyoung Cho today expressed interest for consolidating relations between the two friendly countries by cultural exchange, bilateral trade and collaborations in the socio-economic developments. He hoped that the trade and commerce between the two friendly countries would be thriving in the years ahead. Mr. Taiyoung Cho had been exchanging views with the Chairman of Bashundhara Group Mr. Ahmed Akbar Sobhan at the conference hall of the Group’s corporate office this afternoon. 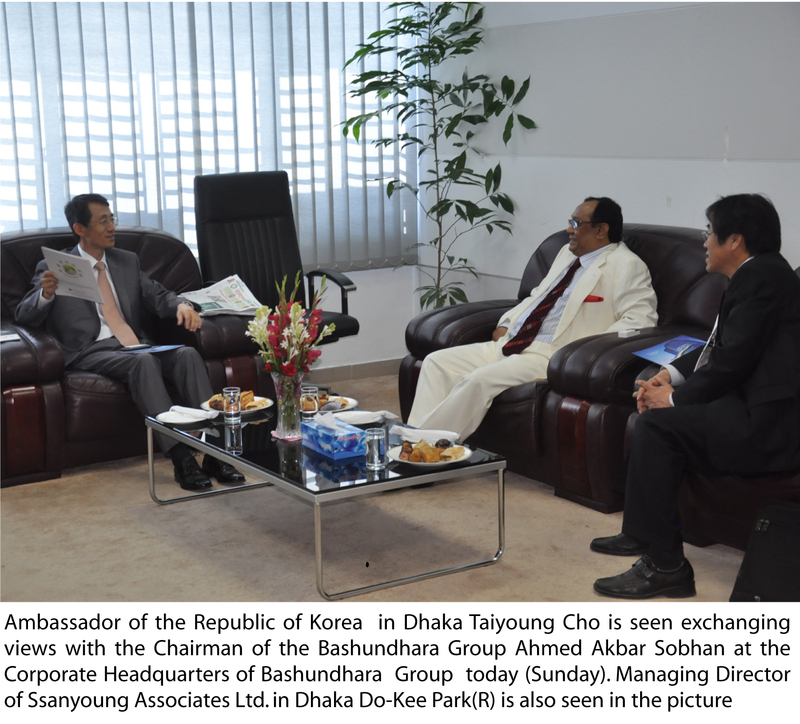 The Managing Director of Ssangyoung Associates Ltd in Dhaka Do-Kee Park (Harry) accompanied the envoy. Chairman of the Bashundhara Group, Mr. Ahmed Akbar Sobhan, welcomed the Korean entrepreneurs to invest in the country’s power, basic infrastructure, water-logging solutions and shipbuilding sectors. He also lauded the country’s investment climate and the future potentials. They also discussed about the import and procurement of industrial raw materials and heavy machineries from South Korea. The BG Chairman also briefed the Korean envoy about the overall operations of the enterprises within the group and the upcoming projects. They also discussed different issues of bilateral interest.